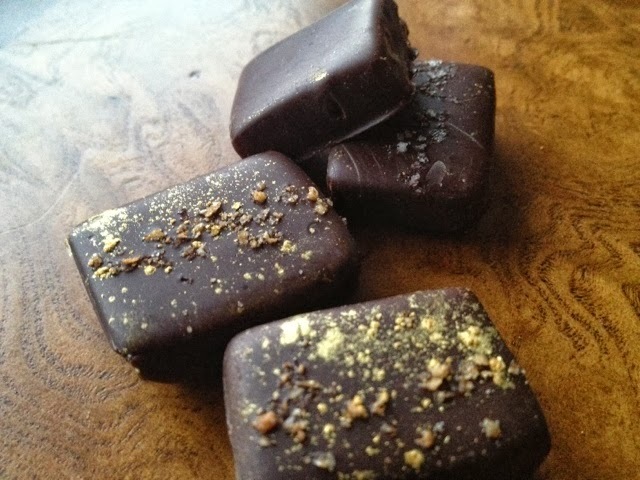 Sometimes the best confections are a result of a passionate chocolatier experimenting. This is the case here which means I am very sorry to report that these salted caramel beauties are not for sale anywhere, at least not yet. A special thank you to Teri Bozeman for experimenting and including me. Please don't stop. Complexity. I'm looking for an experience where the flavor changes as I taste. I want to chase the notes, try to identify them, then commit them to memory for future tastings, pairings, and mood swings which might require such an essence. I don't want overly sweet, I don't want to taste the sugar first. I don't want so much overpowering heat or any other aroma that I can't find any other flavors. These caramels accomplish all of the things I want in a confection. Stunning, subtle, leaving me wanting to taste again (always, my ultimate test of any chocolate or confection). A fine example of what "craft" or "artisan" should be. 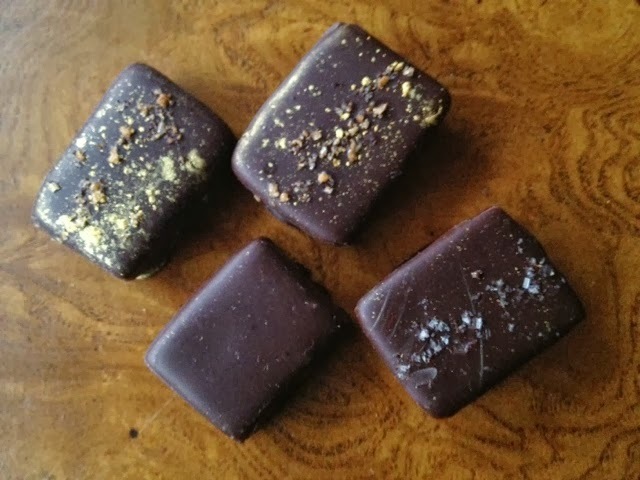 These caramels are soft, the texture is beautiful, and the flavor keeps you guessing. Did I taste ghost chili? The gold topped nuggets pack a powerful kick of heat mixed with sweet. The heat doesn't linger too long though and soon you are ready for your next bite. I recorded a Vine while I was tasting however it wouldn't upload...here it is in an unlooped state.